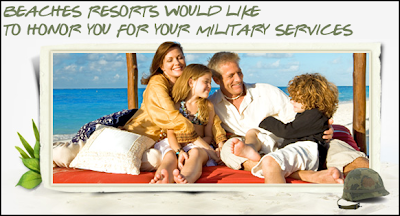 Beaches Resorts Offers Increased Military Discount For Fall Travel! Beaches Resorts continues to give thanks to the courageous men and women who have served, or are currently serving in the line of duty, by offering military personnel and veterans an additional 5% off their year round 10% discount for fall travel to any Beaches Resort. For bookings made now through October 25, 2013 for travel between September 3, 2013 and October 31, 2013 in any room category, military personnel receive a 15% discount off their room at Beaches Turks and Caicos Resort Villages and Spa, Beaches Ocho Rios Resort and Golf Club or Beaches Negril Resort and Spa. For military personnel looking to travel with additional guests, Beaches Resorts is also extending a 15% fall discount for friends and family traveling at the same time. The offer is valid for up to three military/non-military rooms maximum also booked at the same time by the qualified military discount holder. For those seeking to add some adventure to their vacation, military personnel, along with their friends and family, will also receive 15% off an Island Routes Catamaran Cruise booked on property only. To qualify for all promotions, proof of military identification or discharge certificate is required upon check-in at the resort and at the Island Routes Tours Desk when booking a Catamaran Cruise. Certain restrictions apply. For more information or to book, Click Here or call 1-888-373-3677.